Sharable moment: Claire basking in the sun of Rachel’s Bath, on Compass Cay, Exumas! The other day, I received a Facebook message from an acquaintance who in the course of our brief exchange, said, “You sure post a lot from your ‘remote locations.’” Their quotes around “remote location,” not mine. It wasn’t the first time I’d received an offhand remark about my posting frequency on Facebook. And truthfully, it wasn’t news to me. I know I post a lot. But I would like to offer some perspective. When we moved onto the boat, we knowingly left behind our friends, our family, coworkers, and our community. Everyone that you interact with in a given day. It was one of the hardest parts of our decision, and we’ve come to realize how valuable even the briefest interactions are. Dropping Claire off at preschool and having a quick chat with the fellow moms or dads. Aaron having a beer with a collegue after work. Even the predictable banter with the same barista at the local coffee shop each day. They are all little opportunities to connect with others. If you think about it, when was the last time you emailed someone, not to coordinate schedules, but to catch up with them and ask them about their day/week/month? When was the last time you took the time at the end of a long day to call someone and check in? Or how often do you schedule video calls with friends and family? Honestly, back in “land life,” we hardly ever did. I get it. Life is busy. We used to be in the daily grind of never enough minutes in a day. But whether it’s top of mind or not, you share your day with others – mostly in face-to-face interactions. And if nothing else, you share the events of the day with your spouse. When we are in a bigger port, we are fortunate to interact with a few people in a given day –maybe the owner of the market or the server at the restaurant. Sometimes, we’re blessed to meet other cruising couples or families and plan outings together. But other times, we are in remote locations and don’t interact with anyone else the entire day – or multiple days. And as far as sharing your day with your spouse, well, Aaron spent the whole day with me. Nothing to report that he didn’t witness himself. Phone calls are 20 cents per minute from the Bahamas and while it won’t break the bank, it’s an additional charge, so we try to reach out to friends and family for calls on Skype, Facebook Messenger or Whatsapp. But, understandably, most people don’t want to set up new accounts on apps they don’t already have, and using these apps requires a coordination of schedules on both ends that can be tricky – especially for us, when data can be hit or miss. For the fellow cruisers we meet, we seldom travel together for more than a few weeks before parting ways. Some have cell phone plans, some don’t. Some check their email, some don’t. But one platform that everyone seems to check, that for whatever reason loads even in the most remote places, with the slightest of data connections, is Facebook. Cruising is an amazing endeavor. It is the best decision we ever made for our family. In our three months in the Bahamas, we have been rewarded more than I ever could have imagined in the richness of our life and the variety of our experiences. But it is also, at times, extremely lonely. Facebook is our connection to family and friends back at home. It’s a way for us to see what’s going on in our old community. It’s a way for us to stay connected with the friends we meet while sailing the open seas. And it’s a way for me to share our day, even if it’s just to the social abyss. I post not to collect likes, or count comments – certainly not to clog anyone’s feed. I post for the comfort it brings to me, knowing that even though friends are hundreds, sometimes thousands of miles away, they’re still right there, on the other side of that screen. Eleuthera was a big milestone for us. For months, we readied the boat in the comfort of the East Coast, and then found community and conveniences in the Abacos. From the Abacos, it would have been an easy trip back to the States. But heading to Eleuthera was us deciding, once again, to put more miles in between. 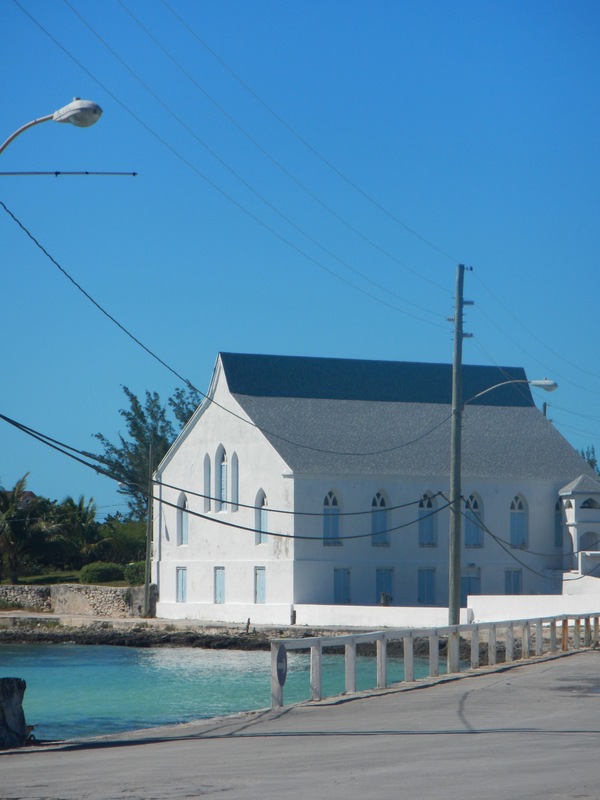 In many ways, Eleuthera was the opposite of the Abacos. The Abacos was a perfect introduction to cruising the Bahamas – a collection of beautiful settlements that welcomed the cruising community, had a steady stream of tourists, and offered everything from towns rich with restaurants and resorts, to quiet reprieves with quaint shops and beachside picnics. Eleuthera, on the other hand, was one big island 110 miles long, with the Atlantic Ocean to the east and Exuma Sound to the west. A handful of towns were sandwiched in between pink sand beaches and breathtaking rocky cliffs – finally, some elevation, where the Abacos had been one flat pancake after another. Unlike the Abacos, the areas of recent development and healthy economies were highly concentrated. The disparity of wealth and poverty within a stone’s throw of each other reminded us a bit of Chicago. Governor’s Harbor, one of the biggest towns on the island and the original capital of the Bahamas, before it became Nassau, was an interesting place. A beautiful home from the late 1890s had been recently restored as a well-curated library and two grocery stores boasted shelves overflowing with all of the basic necessities. Meticulously maintained homes off of Queens Avenue shone bright with fresh coats of pastel, and the French Leave Resort that hugged the southern hook of the crescent-shaped harbor was a property like none we have ever seen, taken over by Marriott just a few months before as part of their Autograph collection. But everywhere, there was dilapidation. Shacks that appeared abandoned, with boarded up windows and piles of rotted wood, were still very much lived in. Eleuthera’s tourism exploded in the ’70s, with investors and property developers creating sprawling resorts – a glance at the topography here makes it easy to see why. But with hurricanes, a rampant drug trade (which has since been eradicated), and two market crashes, the tourists stopped coming and the resorts were left to deteriorate – ghost towns that still take up a considerable amount of property on the island, and valuable oceanfront acreage. We explored two in Governor’s Harbor alone, the most impressive being the former Club Med resort. The property was destroyed by Hurricane Floyd in 1999 and never reopened. Developers with the French Leave Resort had a full plan to revive it as recently as 2006. The latest date on the architectural progress drawings we found was 2009, and we all know what happened to the economy around then… The enormous pool remains, full of stagnant brown water. The tennis courts lie past a villa completely enveloped by overgrown foliage that no doubt had once been expertly trimmed. The development office remained as it was the day the staff left – tossed laptops, reams of financial documents and architectural drawings, and glossy marketing kits designed to lure investors into what would have been the most beautiful and exclusive property on the island. Hatchet Bay and Gregory Town to the north, and Rock Sound to the south, all showed signs of better times. (We unfortunately did not get a chance to visit Spanish Wells, a cruising hub, or Harbour Island, a charming resort town on the northern tip of the big island.) And we learned from the locals that the young people on the island flock down to Bannerman Town at the southern tip for work, farther south than Rock Sound, our jumping off point for the cross to the Exumas. Eleuthera was also a rude awakening from the seclusion from weather that the Abacos provided. Plenty of cold fronts came through while in the Abacos, but with the big island to the west and the small cays to the east, we could always find protection during a blow. 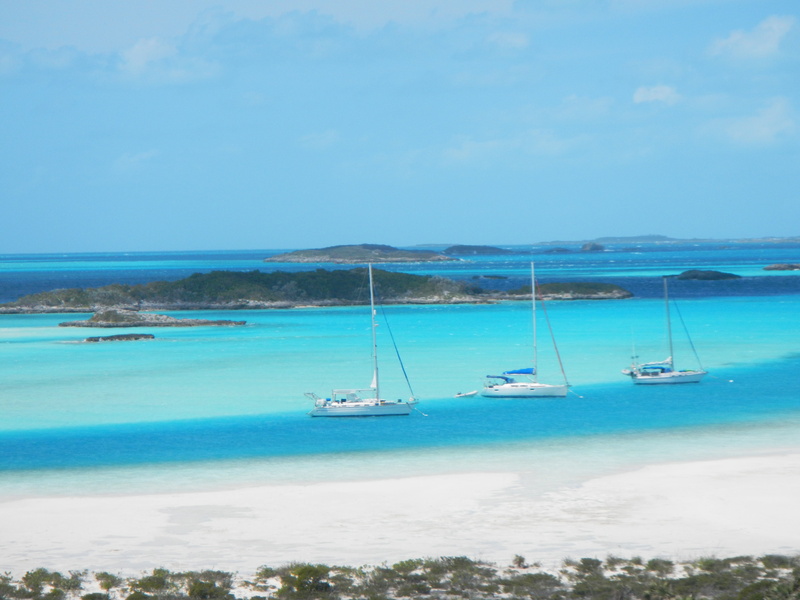 When transiting Eleuthera, you sail down the western coast, and with nothing but the wide open ocean of Exuma Sound, there are very few areas of westerly protection, and truthfully only minimal northern and southern protection in the harbors. As would be our luck, a strong S – SSW blow came in while we were in Governor’s Harbor and sat there for three days. Aaron saw it coming and we reserved a mooring maintained by the French Leave Resort to avoid the worry of dragging anchor. But as the storm picked up in the middle of the night, the wind shifted further to the west, for which we had no protection. Bouncing around on the mooring became absolutely untenable, the dinghy bashing into the transom, the contents of our salon flying everywhere. At dawn, we moved and set the anchor in a corner of the harbor behind a small jetty with marginally better protection from the swell. After the cold front finally clocked to the east, we were able to sail down to Rock Sound and set anchor in a harbor so flat and motionless, we checked a few times to make sure we weren’t aground. All of this aside, we made some wonderful memories while in town. In Governor’s Harbor, we soaked in the decadence (and beachside freshwater pool) of the French Leave Resort, with access to the property amenities as a perk for using their mooring. We rented a car and drove north along the coast of Exuma Sound, explored a cave and learned some fishing tips from local fisherman at an authentic beachside bar. We camped out at the library, grabbed donuts from the bakery down the street, danced to techno-reggae at the Friday Night Fish Fry, and happened on a political rally in Rock Sound, complete with a bouncy house and cotton candy for Claire. Eleuthera was a force, one I think we still haven’t fully digested. And just like that, we were off to find the next.